Stephen Davies: Come the Japanese invasion in 1941, as far as I know, the original lens was broken up and thrown down the cliff into the water and the lighthouse machinery put out of commission. In Tony Banham’s exhaustive campaign narration (linked below), the keeper and his eight staff were evacuated at 1030hrs on 13th December by APV (Auxiliary Patrol Vessel) Frosty Moller and taken to Aberdeen. Stephen adds: I have learned that the APV Frosty Moller, was a commandeered into being a service tug. She was twin screw, 525 tons and built by Dublin Vickers in 1927 as the combination tug-tender Southland for the Bluff Harbour Board, New Zealand (2). 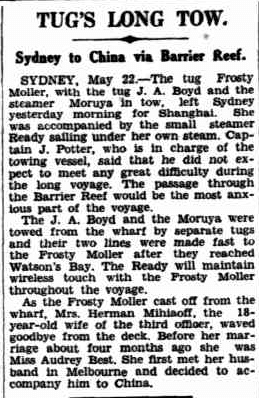 She was sold to Moller in 1936/37 (see the last Lloyd’s Register entry for her at 3). The ship was captured by the Japanese (possibly raised post-scuttling since it seems all bar a few vessels were commanded to be scuttled on 19/12/41) and put into service as the Haraji/Harachi/Genchi Maru (there is some debate about which is the correct name) converted into an auxiliary netlayer. And was later sunk by a US air attack 26/11/43 (or possibly 24/1/44) in Ceihang (or Chianghai) Bay, Guangdong, in position 21.33 N, 112.00 E.
Warsailors.com has this forum concerning the Frosty Moller with details and conjecture about her time in HK and her demise. This article was first posted on 3rd May 2015.